Estate Counter is not the form you're looking for?Search for another form here. Who needs a WB-44 Form? WB-44 is a form approved by Wisconsin Real Estate Examining Board as a Counter-Offer to Residential Offer to Purchase (Form WB-11). It is to be used to a real estate broker acting as an agent of one of the parties to a potential residential property purchase and sale transaction. A Party initiating the submission of the Counter-Offer can be either of the parties: a Seller or a Buyer. What is Counter-Offer WB-44 Form for? Counter-Offer is supposed to be made on paper in a legally binding document to enable either of the parties state the provisions indicated in the Offer to Purchase or a previous Counter-Offer they disagree with and suggest their ideas how this can be handled to reach an agreement and close the deal. Is Counter-Offer accompanied by other forms? The form as such does require an accompaniment, however, logically it should reference the Offer to Purchase and an already-made Counter-Offer. (In the latter case, it serves as Counter-Offer to a Counter-Offer). 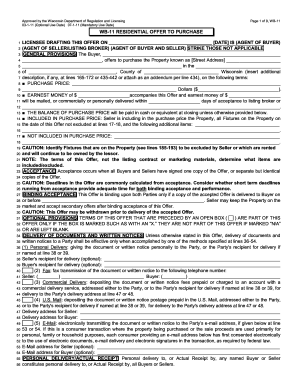 When is Wisconsin Real Estate WB-44 Form due? The due dates of submission and acceptance or rejection are to be discussed and agreed upon by the parties to the potential transaction. 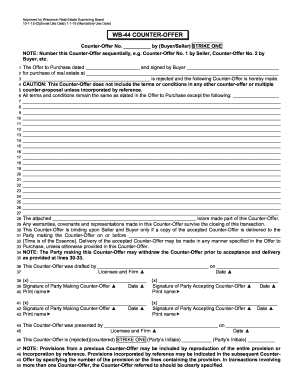 How do I fill out Counter-Offer WB-44 Form? Where do I send Counter-Offer WB-44 Form? The Counter-Offer is to be drafted in two original copies, one is retained by the party making the Counter-Offer, the other is to be delivered to the other Party. A copy is to be retained by the agent drafting the document. The Indiana Department of Administration is responsible for the disposition of ... 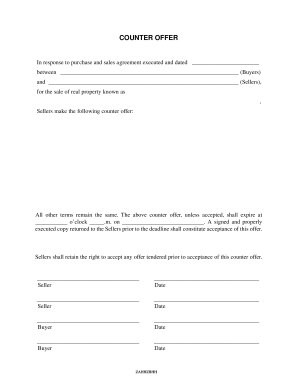 Conditional real property purchase agreement outlining the terms of sale.